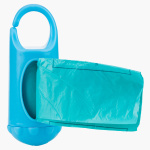 Nuby Tie-n-Toss Disposable Diaper Bag with Dispenser | Blue | Lighty scented bags in order to fight with odour. Get this disposable diaper bag set and be worry-free while you travel with your little one. These bags are biodegradable making it convenient to use and dispose of. With a light scent, these bags neutralise the odour from the diapers. The dispenser filled with diaper bags can be hung anywhere and is extremely easy to use. Feature 1 : Lighty scented bags in order to fight with odour. Feature 3 : Ideal for travelling.